Behold! The ultimate ‘granddaddy’ of matrix scripts is here again. The Ethereum AutoPay Script is packed with all the previous features that its sibling script (Bitcoin AutoPay Script) has. The difference is: Ethereum is the main processing currency of this AutoPay Script because so many of our valued clients asked for it. 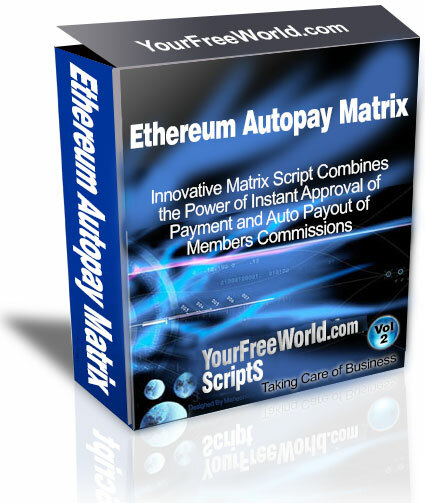 With this matrix script, you can perform automatic payouts and auto payment verification with Ethereum in mere seconds. How cool is that? If you didn’t know, Ethereum is the first digital currency that’s recognized by the Govt. of United States. In simple words, Ethereum will soon be used parallel to USD (dollars). It is also the second best digital currency after Bitcoin and is rated at $260 per ETH. Many investors/merchants have already invested a huge sum of their money in this currency as it is remarkably increasing and is soon to dominate Bitcoin currency. In other words, when you get paid via Ethereum, your future becomes stable! Like its sibling, Ethereum AutoPay Script is equipped with Coin Payments API. This simply means that your payments are verified and paid directly to members, in an instant. They don’t have to request for a commission or anything time-consuming. Say goodbye to hours of frustrating setups. 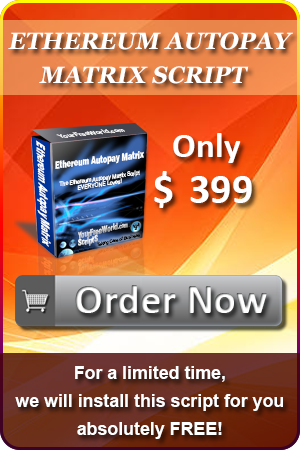 This matrix script also takes less than five minutes of your time to set-up and get started. So, what are you waiting for? BUY NOW! Accepting Ethereum via CoinPayments and you can also add 5 more Ethereum merchant gateways of your choice. Ethereum IPN and API for auto-approval via CoinPayments for Automatic Position Approval and Auto Payout of Commissions.